Home Off Beat	Lightning Alarm Clock: A mini-thunderstorm to wake you up! Lightning Alarm Clock: A mini-thunderstorm to wake you up! Whoever invented this unique alarm clock must be an ardent sleeper himself because the way this clock raises the alarm is guaranteed to make you jump off your bed. The Lightning Alarm Clock is a regular table clock with a very special add-on. It sports a hand-blown glass tube attached to the top of the clock. 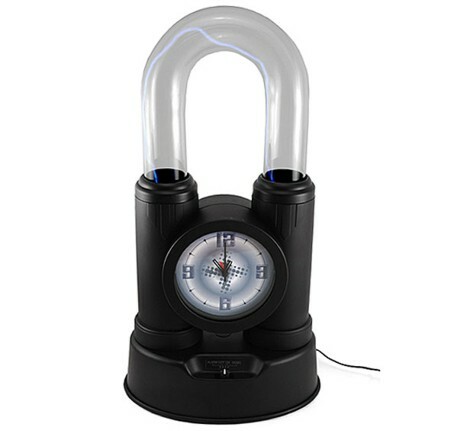 The glass tube holds a Tesla coil which is the main attraction of this alarm clock. As soon as the alarm sounds, the glass tube is filled with high voltage of lightning and starts a mini-thunderstorm. This electricity show will definitely persuade you to leave the bed immediately. The clock relies on one AA size battery for its normal functions while an AC adapter is required to experience the lightning storm. The Lightning Alarm Clock is yours for $59.95. Note: Not recommended for children below age 10. Flip clock on legs stand high!